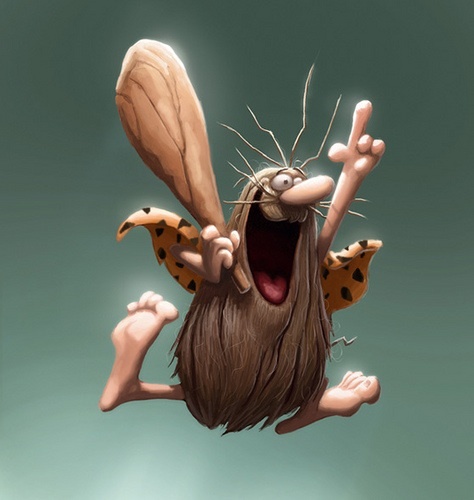 re you ready to unleash your inner caveman? Enjoy all the Olympic clean and jerk benefits with your caveman guide! There is no getting away from it: the Olympic clean and jerk is a challenging exercise. Often beyond the reach of the beginner trainee, this technical compound movement is regularly overlooked in favor of easier lifts. Yet what if there was a way to enjoy ALL the clean and jerk benefits today? There is, and it is easier than you might think. All it takes, are some simple-to-follow instructions to turn this exercise from a fearful foe into a trusted ally. Beginning with your choice of apparatus, you can quickly mould this movement into a mass builder par excellence - the kind of exercise you can perform SAFELY. The following guide shows you some caveman tips you can use right now! Indeed, your choice of training tools can positively impact the way you perform this movement. Choose kettlebells or dumbbells, and you will remove any safety issues when lifting a heavy barbell over your head; or select sandbags, and you will turn this movement into a brute exercise for your inner Neanderthal! 2. Just one work set. This king of Olympic movements is a total-body exercise, making it a great ultra-abbreviated training choice. Think you can't build muscle and strength using one single exercise? Science shows just one single work set trained intensely provides most of your muscle building gains. Indeed, extra sets can often be counterproductive, leading to burnout and injury. A more effective approach, is to exercise some Prehistoric prudence along with your muscles! 3. Heavy and high repetitions. The efficacy of high repetition squatting is well-known, and can be traced back through the annals of history. Indeed, strongman Joseph Curtis Hise was to revolutionize weight lifting with the squat in the 1930s, making it the core of his training philosophy. So what makes the squat movement so crucial to your gains? Simply, vigorous leg work is your best testosterone booster leading to increased strength and muscle growth. This is why high repetition leg work like 20-rep-squats works so well. 4. Take a deep breath. The extraordinary benefits of squats don't end there. Deep breathing squats 1940s Style would pluck the dying 109 lbs Vim magazine editor Roger Eells from his deathbed and transform him into one of the world's best built men. And here is where things get exciting: you can use the same deep breathing high repetition methods with this dinosaur movement. Are you ready to unleash your inner caveman?